NIGERIA AS A SYMBOL OF INEQUALITY...IS RESTRUCTURING THE SOLUTION? It is sometimes said in certain circles that the Yoruba is the only ethnic bloc, among the major ones in Nigeria, that has not called for the disintegration or dismemberment of the country. Individually, Yoruba may have, at various times, wished and called for a divided Nigeria. But the people as a group have never done so publicly. Rather, the Yoruba have been advocating for a regional arrangement that will whittle down the powers of the centre. This is a middle ground position. However, you can hardly say the same thing of the other ethno-political blocs. Those who have a sense of history will readily recall that the North was the first to call for the dismemberment of Nigeria. The bloody coups of January and July 1966 ignited feelings of secession in most northerners. Even though the counter coup of July 1966 and the pogroms that followed were supposed to calm the frayed nerves of the North, they did not. Rather, the region bayed for more blood. It was in that fit of bitterness that the idea of secession crept into their imagination. Consequently, the less restrained among them began to advocate for a divided Nigeria. It was in response to the prevailing mood in the North at the time that the Yakubu Gowon government, in August 1966, declared that the basis for one Nigeria no longer existed. Even though the North later went to war to enforce the idea of “One Nigeria,” it is a historical fact that the region was the first to nurse and propagate secessionist sentiments in the country. If the North was the author of a divided Nigeria, the East was its finisher. The counter coup of 1966 and the pogroms had taken a heavy toll on the people of the Eastern region known as “Biafra.” The situation was made worse by the fact that the people of the region had nobody to appeal to. The then Federal Government led by Yakubu Gowon, a Northern army officer, was complicit in the blood­letting. The situation, regrettably, drove the Eastern region into a precipice. That was how it came to declare its own republic. Strangely, however, the Gowon that had, a few months earlier, held that the basis for a united Nigeria no longer existed was the one that took up arms against the secessionist move of the Eastern region. That was hypocrisy in action and irresponsible inequality writ large. 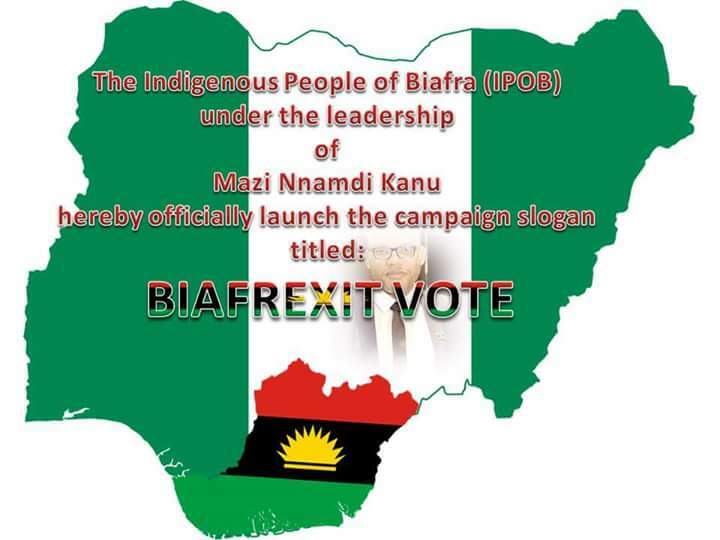 The war has since been lost and won but the Igbo speaking Biafrans, whom were mostly at the receiving end during the war years are still perceived, rightly or wrongly, as a group that is ever ready to quit the Nigerian setting once an opportunity presents itself. Read also:Who Is An " Indigenous" Biafran? Given the fact that it is always the prerogative of the victor to rewrite history, events took an unexpected turn in post-Civil War Nigeria. The ruling military junta, which was dominated by the Northern Oligarchy gradually but steadily bastardised the country’s federal set-up. The principles of federalism were not only eroded, the country’s republican status was yoked together with strange systems, which ended up corrupting the original idea. The result is that Nigeria, as we have it today, is neither a federation nor a republic and that is why she is not practising true federalism which the Northerners has consistently kicked against. This incongruous set-up has been fueling agitations for either a divided or restructured Nigeria. While the North is holding tenaciously to the present order, apparently because it is benefitting unduly from the incongruity, the other blocs of Nigeria are differently persuaded. Hence, one should not be surprised when President Muhammadu Buhari recently declared that the country’s unity is non-negotiable. In Eastern Nigeria(Biafran region), the more prevalent sentiment is that of a divided Nigeria. The people of the region has overtime, rightly substantiated that the northern dominated governments that have been holding sway in Nigeria have deliberately impoverished the East. A region that was once the fastest growing economy in Africa has been rendered impotent by stifling state policies. The people feel that the growth of the region has been stunted, deliberately. They believe that their potentials will be better realised and harnessed if they are allowed to take their destiny in their own hands. They believe that Nigeria in its present order cannot guarantee them that. A good majority of them want a new country where merit, industry and hard work will count. In the South-West, the popular sentiment, as we earlier noted, is that of restructuring. Their idea of restructuring borders on regionalism. They want strong regions and a weak centre. They want an arrangement where the federating units will be semi-autonomous. When that is the case, each region will take its destiny in its own hands. It will have its own economy by taking ownership of the natural resources that its fauna and flora can boast of. It is an arrange­ment where the regions will not look up to the centre for survival. If anything, the strength of the centre will depend on the health of the regions. They want a truly federal arrangement where the federating units do not exist at the mercy of the centre. These are the various sentiments that reign and rule in multi-ethnic Nigeria. The effort to pigeonhole them has put Nigeria in a lurch. Regrettably, no Nigerian government has been bold enough to deal with the vexed issue. However, for those who want a restructured Nigeria, the Report of the 2014 National Conference instituted by the then Goodluck Ebele Jonathan’s administration has all that is needed to put Nigeria on the path of progress. Those who really appreciate the facts of Nigeria’s retrogression have always had cause to point at the skewed federal arrangement, as the major inhibiting factor. But the 2014 Conference sought to reverse all that. It tried to introduce an arrangement where no part of Nigeria will feel claustrophobic. It tried to free the system and the people from a lopsided arrangement where one group or region feeds fat at the expense of the others. Such an unjust arrangement has been the bane of the federation. It is largely responsible for the pockets of agitations and upheavals in various parts of the country. I remember the Niger Delta Avengers whom has been destroying oil installations has it in their peace demand list. Unfortunately, the government of the day has decided to throw overboard the well thought out recommendations that emanated from the conference. The government does not appear to be interested in the populist dimensions of the report. That is why it does not want to touch the report. It appears bent on operating the discredited system that has put Nigeria on edge. Significantly, some elder statesmen who have looked at the unequalled stake and lopsided structure of Nigeria have stepped out to be counted among the few patriots that the country can boast of. Prominent among them are the former vice president, Atiku Abubakar, and renowned constitutional lawyer, Prof. Ben Nwabueze. Both have dutifully called for the restructuring of the country. They did not just speak. They spoke from the position of someone who knows the issues. Unlike those who want to throw away the baby with the bath water, Atiku and Nwabueze have chosen to reflect on an approach that may work, that is if all the constituent parts agrees. They have taken a hard look at the system we operate and are convinced that we need to move away from where we are. Their verdict is that the country should be restructured in a way that will give every ethnic nationality an equal stake. For those patriotic do-gooders, who have been holding Nigeria by the jugular to free the country from their vice grip, those who has ignored calls to negotiate the country’s continued existence amidst torrents of separatist movements, shouts and narrations, if they do not let go, Nigeria will continue to gasp for breath. And in no time, we will have nothing but pitiful reminiscences of a Northern dominated country that once was.